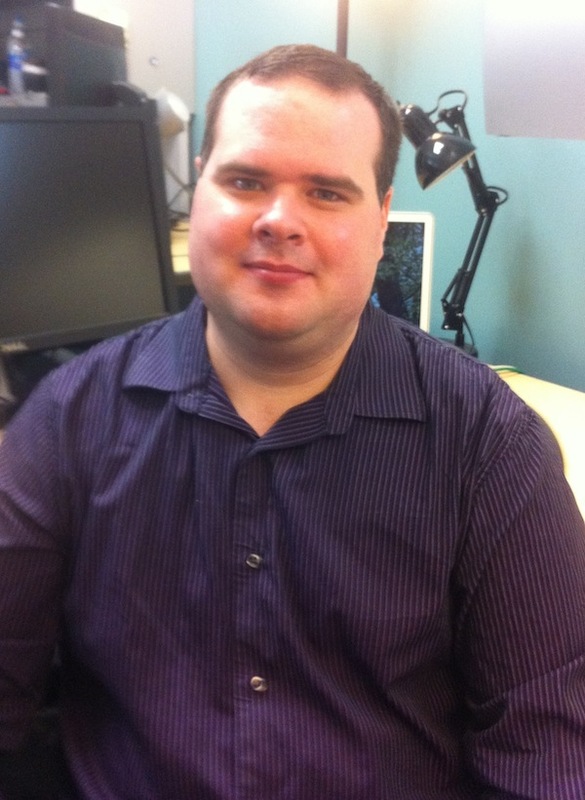 This week’s BEACON Researchers at Work blog post is by MSU postdoc Matt Rupp. As a researcher, I have never been completely comfortable dedicating myself to a single field of study. My formal background in both computer science and evolutionary biology reflects this desire to stay diverse. The products of cross-pollination between the methods and ideas of different disciplines are where I believe innovation and novelty lie. It is likely that these interdisciplinary collaborations will open new avenues for testing hypotheses that are otherwise intractable. The project that I am currently working on exemplifies this blending of disciplines to produce a new way of testing hypotheses in the field of telecommunications. I work with a group of researchers from multiple disciplines to synthesize knowledge from economics, telecommunications, computer science, and evolutionary biology to understand how telecommunication regulation affects the growth and development of the Internet. Combining our expertise, my colleagues and I are creating a virtual telecommunication market: a digital economic ecosystem with selfish individuals that often evolve their behavior in an open-ended manner. By examining how these individuals evolve under different regulations, we hope to better understand how specific regulatory decisions will affect the real world. Regulation should strike a balance between the often-opposing forces that encourage growth and innovation and those that support competition and fairness. If there is too much or poorly-focused regulation, investment is stifled; if regulation is absent or too limited, there is the potential for oligopolies or monopolies of choice, lack of fairness, and market fragmentation. There is no lack of theory about striking a good regulatory balance, but there is little in the way of empirical testing. As a result, regulation often leads to unintended consequences. This is because market participants, like natural organisms, evolve to exploit their environment. Market participants will often find loopholes and strategies to leverage the regulatory environment to their advantage in ways that were not envisioned by policy makers. The telecommunication industry is a rapidly changing area where empirical testing of regulation prior to implementation will be beneficial. Questions of how neutrally network traffic should be treated, whether or not voice over IP (VoIP) telephone service providers should be treated the same as traditional providers, and to what extent content and access should be bundled are only a few of many areas of regulatory concern. Answers to these questions will shape the cost and availability of telecommunication-based services to consumers as well as investment and deployment of future technologies. By examining in advance the consequences of specific regulations on existing and future telecommunication technology or services, my colleagues and I seek to help policy makers make better-informed decisions, potentially avoiding costly or undesired outcomes. 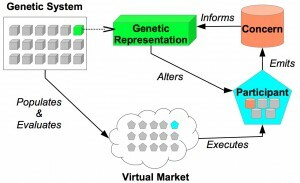 Figure 1: A caricature of our virtual market highlighting the three types of market participants and their interactions. The virtual market my colleagues and I are creating encompasses the fundamental elements of the telecommunication industry in a highly configurable manner. 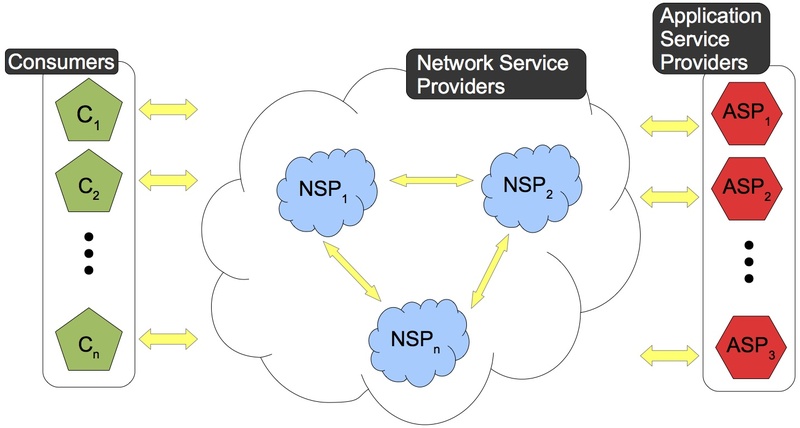 It currently consists of three different types of market participants: consumers, network providers, and application providers as shown in Figure 1. Although the behavior of some participants is fully determined by us, other participants in the virtual market use genetic representations (such as GP-tree sets) to interpret and respond to market conditions. For example, a network provider’s genetic representation might take into consideration the number of customers, the amount of competition, and the congestion on its network for a particular location in the market to make a decision as to whether or not to invest in additional bandwidth for that location. Over the course of the experiments, the evolvable participants improve their competency through selection based upon their performance in a series of market competitions. By comparing the behavior of well-adapted participants evolved under different regulations, we hope to understand the consequences particular regulations have on the development of the market. Part of my contribution to the project is make it easier to translate behaviors of real-world market participants, the information required to inform those behaviors, and the regulatory policies we want to test into the software and configuration of our virtual market experiments. 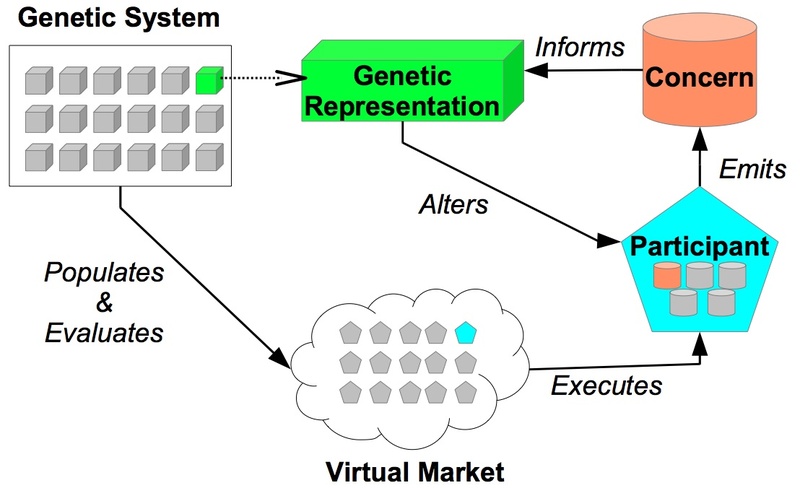 I also work to make the interface between the virtual market and the genetic representation systems work together without the need for much intervention when we modify one side or the other. This is important because configuration tractability and a low cost of adding or removing properties of the market are important to our group to create an understandable and flexible experimental system. Figure 2: An abstraction of how genetic representations, market participants, and concerns work together to produce changes in the market. One of the tools I worked with my colleagues to achieve these twin goals separates an agent’s possible behaviors into a set of concerns. Each concern provides a configurable way to transmit information to the participant’s genetic representation without having to write a new interface between the genetic- and market-sides of our system when we add something new to the market or want a participant to have a new behavior. Figure 2 shows how concerns relate to market participants and the genetic representations. Concerns are very flexible; they provide the genetic representation a set of file-system like paths to access specific information about the market. By restricting which paths a representation is allowed to use, we can create different views of the market for each representation. Concerns also provide a generic means for a representation to react to the information they provide by causing the participant to perform actions in the market. In combination with our evaluation tools, I believe the concerns utilities have the potential to help other researchers more quickly develop and test similar types of hypotheses in different domains. d. Further, I believe our work is a good example of researchers from different disciplines coming together to create new tools to study complex hypotheses. It is my hope that what we’re learning from our experiments not only helps policy makers but also enables other researchers to test similarly challenging hypotheses in different domains. For more information about Matt’s work, you can contact him at ruppmatt at msu dot edu. This entry was posted in BEACON Researchers at Work and tagged BEACON Researchers at Work, Evolutionary Applications, telecommunications. Bookmark the permalink.